Autism is a life-long developmental disorder and the most prevalent of a subset of disorders known collectively as autism spectrum disorders (ASD) or pervasive development disorders (PDD). Autism is characterized by impaired social interaction and communication, and by restricted and repetitive behavior. The diagnosis of autism usually occurs when a child is 2 to 3 years old; children either exhibit developmental delays from birth, or after a period of seemingly normal growth suffer a “regression” and lose social or language skills they had previously gained. Autism is linked to abnormal biology and chemistry in the brain that affects the development and functioning of crucial parts of the brain, including the amygdala, hippocampus, and cerebellum.1 The neurochemical communication is altered, creating any number of social, language, physical and emotional abnormalities that are identified as symptoms of autism. Current and future research is working to accurately explain these abnormalities. Environmental factors – thought to be in combination with genetic factors; examples include viral infection and air pollutants. Other disorders – higher than normal risk can be associated with fragile X syndrome, tuberous sclerosis, Tourette syndrome and epilepsy. While most children are slow to gain new knowledge or skills, some have normal to high intelligence. These individuals maintain social and communication problems, yet tend to excel in a specific area such as math, art, or music. These children are often called “autistic savants”. Autism remains a difficult disorder for children and their families, but with increasing knowledge of the disorder the outlook is getting much better. Social and emotional constraints may form for family members, caregivers, as well as the person with autism. Also, some people with autism will develop seizures. While outlook does depend on severity of the autism, many of the symptoms of autism can be improved with the right therapy. 1. Cook EH. Brief Report: Pathophysiology of Autism: Neurochemistry. J Autism Developm Disorders. 1996; 26(2): 221-5. Hemmins WA. The entry into the brain of large molecules derived from dietary protein. Proc Roy Soc London Ser B. 1978; 200:175-192. 2. White JF. Intestinal Pathophysiology in Autism. Exp Biol Med. 2003; 228:639-49. 3. Baily A, LeCouter A, Gottesman I, Bolton P, et al. Autism as a strongly genetic disorder: evidence from a British twin study. Psychol Med. 1995; 25:63-77. 4. Taylor B, Miller E, Farrington CP, et al. Autism and measles mumps rubella vaccine: no epidemiological evidence for causal association. Lancet 1999; 353: 2026-9. 5. Horvath K, Papadimitriou JC, Rabsztyn A, et al. 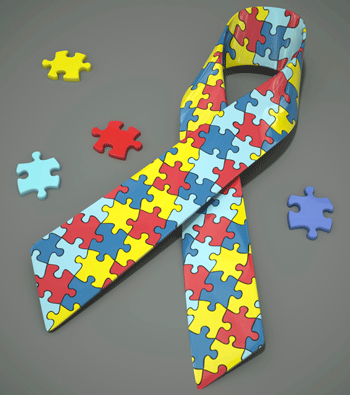 Gastrointestinal abnormalities in children with autistic disorder. J Pediat. 1999; 135:559-563. 6. Black C, Kaye JA, Jick H. Relation of childhood gastrointestinal disorders to autism: nested case-control study using data from the UK. General Practice Research Database. Br Med J. 2002; 325:419-21. 7. Reichelt KL, Knivsberg AM, Lind G, Nodland M. Probable etiology and possible treatment of childhood autism. Brain Dysfunct. 1991; 4:308-19.